Fig. 4. 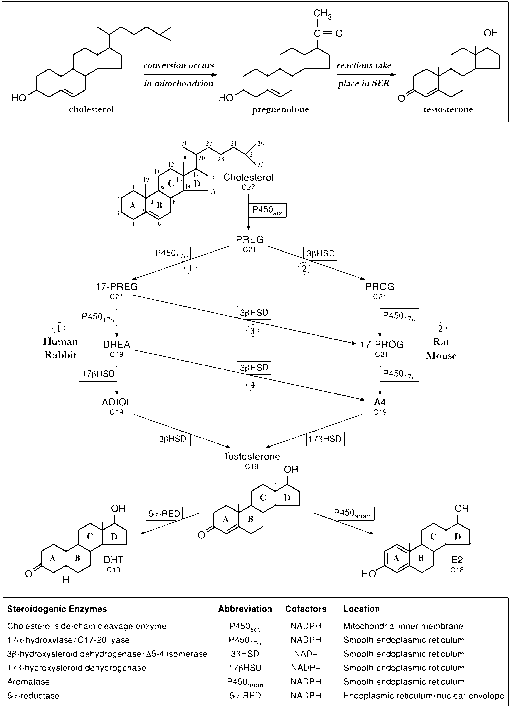 Pathway of testosterone biosynthesis. Of the four possible biosynthetic pathways, the first or A5 predominates in the rabbit and human, whereas the second or A4 predominates in rodents. CHOL, cholesterol; PREG, pregnenolone; 17-PREG, 17-hydroxypregnenolone; DHEA, dehydroepiandros-terone; ADIOL, androstenediol; PROG, progesterone; 17-PROG, 17-hydroxyprogesterone; A4, androstenedione;T, testosterone; DHT, dehydrotestosterone; E2 17P-estradiol. testosterone depends on the species and developmental status of the Leydig cell. In humans, the A5 pathway is predominant (49-52). Mammalian 3P-HSDs comprise a large family of enzymes (53,54). In the human branch of this family, two genes encode two corresponding, type I and II, 3P-HSD enzymes. Both types dehydro-genate 3P-hydroxysteroids and isomerize C21 and C19 steroids. 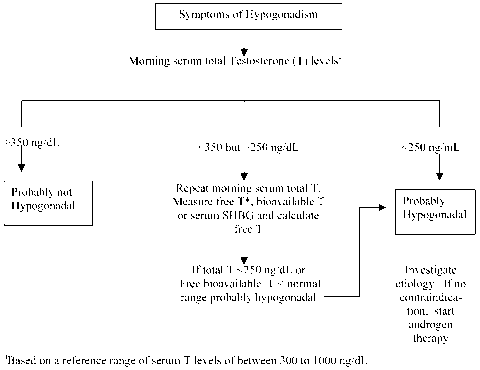 Type I 3P-HSD is exclusively present in placenta and skin, whereas type II is the predominant form expressed in the adrenal, ovary, and testis. In the testis, type II 3P-HSD activity is localized exclusively in Leydig cells (37,55).